In my opinion, your Christmas day outfit can go one of two ways. You will either opt for glitz and glam, or total comfort. It's a decision that most people will have a consistent choice on every year. I am always a glam Christmas-er. We always have a huge family get-together and everyone dresses up. I think its the best excuse! I pretty much will always go for something glittery if I can.. even if its just on my nails! So I've put together two outfit choices for Christmas, that cover the two options for me... Comfort vs Glam! 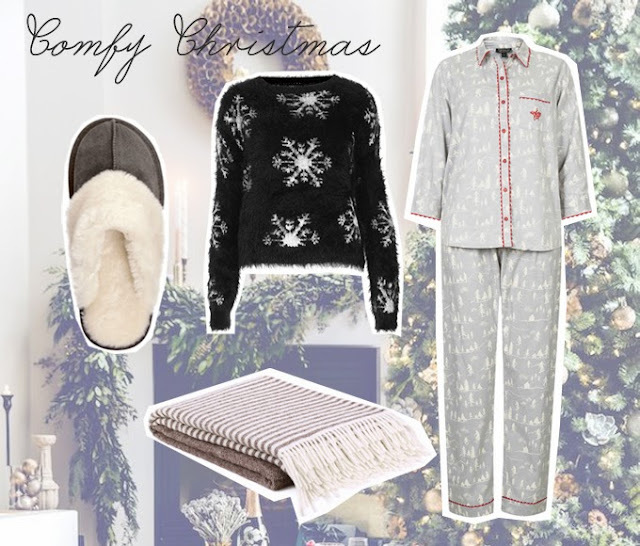 Even though I am still firmly on the side of a glam Christmas, that cosy collage could always sway me! Those pyjamas look so comfy! However, I don't think much can beat the gorgeously sparkly Topshop dress. Fingers crossed I find it under my tree on Christmas morning!